Hawaii is deemed the birthplace of modern surfing. There is no place in the world where the waves break as regularly as here. There is no place where surfing is such an integral part of a peoples’ history and culture. Hawaiians have used wood and boards to glide through the ocean for ages. No place in the world has as lively a history of surfing as Hawaii does. Part 1 of the Anemina Travels mini series about surfing in Hawaii tells the story of modern surfing. Follow me on the trails of Duke Kahanamoku! Waikiki at dawn. A metropolis facing the ocean. Listening to the sound of the sea. Wish-wash, wish-wash. No noise drowns the beat of the waves. A row of skyscrapers is separated from the beach by a nearly empty three lane street. Fine white sand touches my toes as I walk to the place where the surf leaves a line of fine froth at the shoreline. This is a place where you better walk barefoot. Not only on the sand but everywhere. No worries. If anything you’ll be stared at for wearing closed shoes. The waves roll into the bay in regular intervals, and from the neck and arms of the huge bronze statue of Duke Kahanamoku, colorful lei are dancing in the wind. The duke stands with his back to the beach, a tall surfboard rises upright from the ground behind him. His eyes overlook the street. Most people are still sleeping in this part of Honolulu. The sun is showing in the East, it rises from behind Diamond Head, the tallest mountain in the city’s surrounding. Jetlag has driven me out of bed and I’m in need for a coffee. But I am not the only person who is awake that early. A dozen surfers is floating on the water. Seizing the calmness of the early morning. One and a half hours later Kuhio Beach, to which Duke Kahanamoku welcomes visitors with his outstretched arms and metallic grin, is crowded. Pavilions have opened for visitors and their owners have neatly positioned surfboards, bodyboards, floating tires and signs quoting rental prices around them. By now the hum of vehicles on the street drowns the sound of the waves. There is much more than just one dozen surfers floating in the sea. And in front of the statue the first tourists are standing in queue to get a photo of the legend. It is convenient for them that he is standing with his back to the sea. It’s a much better background for photos than the skyscrapers in the opposite direction. The real Duke Kahanamoku would have never turned his back to the waves. It’s the most important rule of surfing to always keep an eye on the ocean. Even with a surf as regular as in Hawaii, the sea is unpredictable. 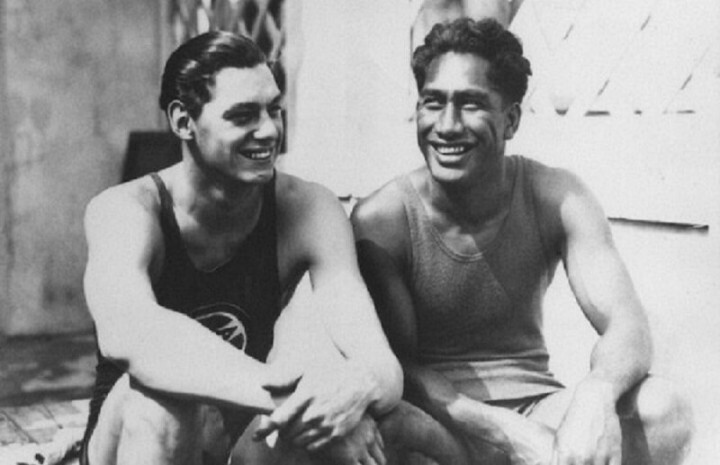 Duke Kahanamoku (right) and Johnny Weismüller at the 1024 Paris Olympics. Surfing was reinvented at the very place where Kahanamoku’s statue now stands. Reinvented by the Duke himself. He who had won Olympic gold as a swimmer multiple times. He who became a Hollywood actor in his later life. He who, in 1905, founded the Hui Nalu Club with some friends. Hui Nalu means wave. Centuries before that, his ancestors had been using their body, wood planks, tree trunks or bunches of bulrush to float through the waves. Surfing is ingrained in Hawaiian culture. 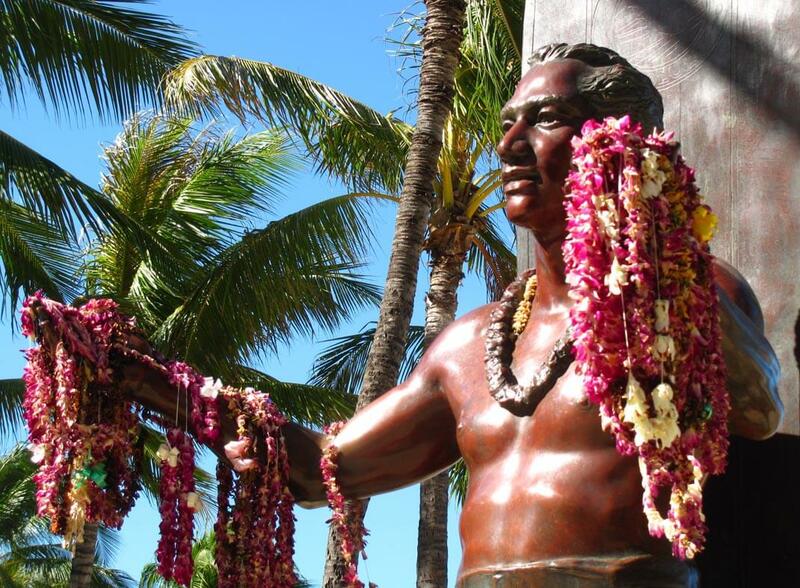 One of the most popular Hawaiian kings, Kamehameha I. was celebrated for being an excellent surfer until long after his death. But with his death and the arrival of missionaries, surfing became discredited and was banned from Hawaiian everyday life. It remained in oblivion until the day that the juvenile Duke Kahanamoku invented and tried a new kind of surfboard at the shores of Waikiki in the early 20th century. The board didn’t have a fin yet but apart from that it looked quite similar to the boards we know today. The „Papa Nui“ was 16 feet long and weighed 114 pounds. But it worked well. Its growing popularity in Hawaii soon spread to the mainland. Duke Kahanamoku was already a famous swimmer and canoeist when he brought surfing to the shores of California – and supposedly even to Australia. Midcentury California saw a genuine surfing boom, all thanks to the man whose memento lives on at the beaches of Waikiki. Next to the bronze statue on Kuhio Beach, today’s surf shops lend boards that everybody can easily carry under their arms. Not only has surfing equipment become much lighter in the past 70 years, but surfing has also become much easier, thanks to new materials and the invention of the fin. Still, there is nothing that has shaped modern Hawaii like Duke Kahanamoku and the Papa Nui. The general interest in Duke Kahanamoku is high in Honolulu. Whenever you look in the direction of his statue, you’ll see people gathering in front of it. They let others take their photos, take pictures of themselves and put new lei on the cool metal arms. To me it’s kind of sad to know that the bronze Duke won’t ever see the countless surfers sitting on their boards, following in his footsteps and waiting to catch the perfect wave out there on the ocean. He who was at home out there, on the water. Next episode: In part 2 of the Anemina Travels mini series about surfing in Hawaii I will show you the best surfing spots for beginners and advanced surfers on Oahu, Maui and Big Island and reveal the spots where you can watch professional surfers exercising. 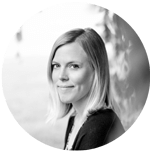 Love this article…now I want to try…maybe! Great info! I went surfing for the forts time last month and loved it! Cool post! What a interesting story. I’ve always been fascinated by surfing, it’s such a mystic sport. Thanks for sharing! Thanks Francesca! I’d be interested in the surf history of California as well – since it is said that Duke Kahanamoku brought surfing to the shores of California! In Florida, we don’t have large enough waves for surfing so it’s always been something that has intrigued me. If I ever go to Hawaii, I’d love to try it out. And I will definitely be thinking of the Duke! Oh yes, you have to! It’s just so much fun! And in fact it is much easier than you would think it is! What an interesting story. It made me think about missionaries and whether they were a boon or a curse. Veering towards the latter, I must admit. So fun to hear the history behind such an important element of Hawaiian culture. I’m in love with the Hawaiian Islands and can’t wait to go back in December! I’ll be in Maui, but I need to plan a trip to Oahu one of these days. Oh you lucky girl! Maui is wonderful in December. I would love to learn how to surf. I took a quick class a few years ago in Australia, but everyone just ended up wet and covered in bruises lol. Maybe I should try my luck in Hawaii. I can’t believe I haven’t made it down to Hawaii just yet! Great history behind the surfing there and looking forward to getting on a board and give it a go. 🙂 Aloha indeed. Duke is rightfully venerated throughout Hawaii for almost single-handedly reviving surfing and perfecting the sport. Don’t forget good surfing on Kaua’i, too! We miss living there. Aloha. Aloha Betsy! Oooh, I’m so sad I didn’t make it to Kaua’i when I was in Hawaii… But since I fell in love with the islands anyway, I’ll come back one day and hopefully visit some of the smaller islands as well!